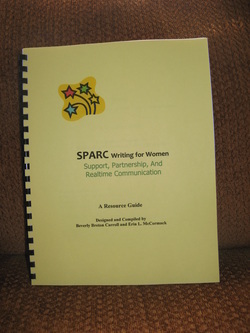 To accompany the SPARC for Women program, we have developed a 92-page Resource Guide, which includes approaches to writing, basic grammar and punctuation, computer formatting, using email and internet, and fun writing exercises. In addition, the Resource Guide offers a list of aids and resources for developing writers, and a list of Nashua, NH, area community resources that support and enable women to continue their growth toward better lives for themselves and their families. The Resource Guide is in its third edition, revised to respond to the requests of the SPARC women, and the needs of any developing writer of the English language. To buy a copy of this guide, please send a check made out to SPARC for $35.00, which includes shipping and handling and a donation to the SPARC program.